For me, Mumbai was my tipping point. The coordinated terror attacks across the city in November of 2008 (has it been that long?) jarred me and many more into a new awareness for this world of terrorism as the norm: 164 slaughtered with 308 wounded.Then massacre the Westgate Mall in Nairobi in 2013 (67 dead and 175 wounded) was revealed in chilling detain in the HBO documentary, “Terror at the Mall.” Then Charlie Hebdo, the Paris November attacks and now “San Bernardino”. We won’t have to say any more than that. San Bernardino. A search for Islamic terrorist attacks on Wikipedia produces a list so long, you’ll get numb reading it. But this is not a politcally motivated post. I often tend to find answers to one problem while glaring at another. 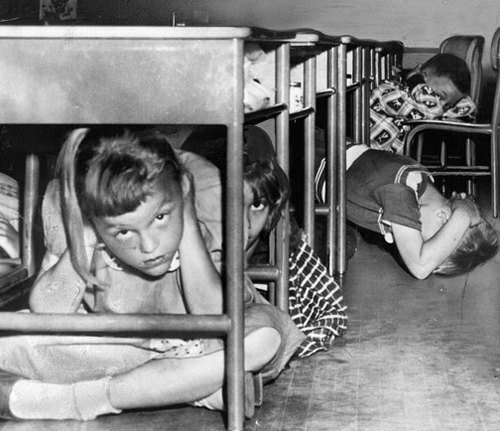 In 1961, the Cold War was in full swing and little fifth graders like myself practiced “Duck and Cover” as often as fire drills. On the surface I suppose we were fine with it but the insidious reality of what we were hiding from permeated this 11 year-old’s psyche so deeply that I began to dream about the bomb going off and even experienc a fallout “snowstorm” that I can remember to this moment. So now we have the threat of armed killers attacking at any moment and what are we to do? So this post comes across my screen and not only did I find it fascinating in a strictly prepper kind of way, the foundational thought that is part and parcel to the actions we take during a crisis, is nothing new but new to me, thank God. Specifically, I now understand the OODA Loop and its relevance to the terror response but also how this military tactic is important in many facets of life, not the least of which is corporate survival. Being prepared before the crisis hits and knowing how to assess the situation during the trauma, is tantamount to life and death – in the business world as well as the real world. Military theory has been employed by many firms, from Sun Tzu’s Art of War to von Clausewitz’s On War and the oft-quoted but rarely credited Air Force strategist, Colonel John Boyd. Boyd literally wrote the book on dogfighting, as his “Aerial Attack Study”” became the jet fighter’s bible. It is a learning system, a method for dealing with uncertainty, and a strategy for winning head-to-head contests and competitions. 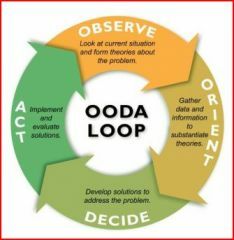 In war, business, or life, the OODA Loop can help you grapple with changing, challenging circumstances and come out the other side on top. Simply put, you are stimulated by an outside element. You then assess that stimulus, good or bad, help or hinderance, flee or fight. Then you make a split-second Decision and then Act. Then the loop part kicks in and you are back at Observe again. Lather. Rinse. Repeat. The key to the active shooter scenario is if you have a plan, or at least have worked out a plan in your mind beforehand, then when the terror starts, you have one up on those around you and even possibly on the shooter. The three off-duty US military guys on the train from Amsterdam to France had a plan. They engaged in the Loop. Briton Chris Norman was quoted as saying (after he assessed the situation and in the matter of seconds) “If I’m going to die anyway, I want to die fighting.” The three Americans just kicked their training into gear and overpowered a madman with an AK. According to the Boyd model, the shooter is not anticipating anyone charging him. His Loop was static and he was not in a cycle of assess and re-assess, while his attackers all chose to act without really “thinking’ about it. He wasn’t prepared for four guys to rush him. Life and death. So too in the business world. The best examples are those who failed monumentally at this feedback loop process: Kodak and Blockbuster. Kodak literally was a brand synonymous with cameras but they refused to see the digital revolution that was overwhelming them until it was too late. At its peak in 2004, the company had 9000 stores and 60,000 employees. But by 2010 they were all shuttered, a victim of leadership that refused to retool and accept the online change that was roaring past them. So, in a very real sense, the business world is awash with “active shooters” of change and those without a plan, or at the very least, a plan to get a plan, are doomed. I am seeing a new industry blossom before my eyes. The Escape Room world is the wild west right now, with room after room opening with critical mass still far off. The mom and pop industry will soo go through a natural selection process and those who are in the Loop, will sustain.